Before he found himself in the co-pilot seat as a 2nd Lieutenant in the United States Army Air Force during World War II, Frank Bell was a young ROTC student at the University of Florida in the early 1940’s. When he was called to service after completing flight training, he found himself assigned to the 467th Bombardment Group. After satisfying the necessary amount of successful missions in the European theater he thought he might be headed to the Pacific theater to fly there, but instead found himself returning home and going to work for Pan American Airlines after the war ended. Frank worked for Pan Am for decades before retiring in the 1980’s and enjoying a quieter life in Florida, where he still likes to cut out the comics from the newspaper and send them to his granddaughter Amanda - my wife. 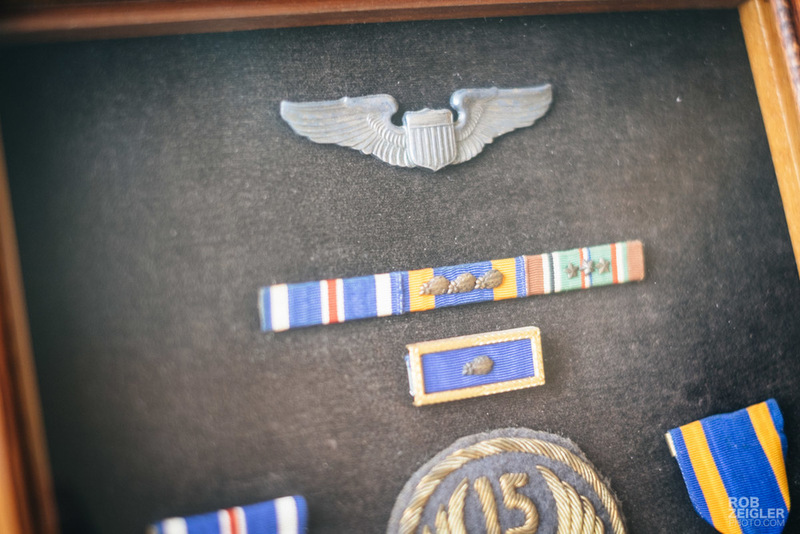 Amanda and I visited Frank and his wife Catherine a few months ago, and I once again found myself fascinated by the medals and plaques he has on display on the wall above his desk (among them: a Distinguished Flying Cross, an Air Medal for completing his required missions and the WWII Victory Medal). What follows is a recounting of some of that conversation with Frank, perhaps long overdue, to learn more about the man behind the medals; a man who I highly respect and admire. I smile back. Frank is an easy-going man with a quick sense of humor. On this November day Frank was quite sharp as we sat down and talked about some of his experiences as a B-24 Liberator co-pilot in World War II. My two grandfathers have passed away, so the ability to sit down and have a personal conversation with a veteran is not something that I usually have the ability to do. I didn’t have any questions prepared for our informal chat, but Frank immediately dove into an anecdote. It’s an anecdote that I had heard before, but Frank spoke to me as if recounting it for the first time. I let him continue, because it was apparent to me that this particular anecdote was how Frank wanted to kick off our conversation. "We had a good crew," Frank continued. "Everyone did their job." In World War II, bomber squadrons would fly in tight patterns in an attempt to cover themselves from every angle. There are multiple guns located around the B-24 as well as the tail and a ball turret on the bottom, so when tightly packed they could cover each other in firing arcs if an enemy were to try to pick one of them off. I asked him if he ever saw enemy fighters and how the crew reacted. Frank also told me a few new stories that I hadn’t heard before. He told me about a particular B-24 in the fleet that nobody hoped they’d have to fly because it was well-known that it was a lemon. Apparently, this particular B-24 Liberator pulled to the left, much like a car would, and it was a constant struggle to keep level. It also somehow managed to leak fluids but at an acceptable level for the USAAF to decide not to scrap it. One day it was heavily damaged in a bombing run and came back for an emergency landing. The crew managed to land that B-24 and all came out alive, but the entire base waited to find out what would become of that hated plane. Finally a bulldozer was called out and pushed that B-24 off the runway, toppling it end over end and totaling it once and for all. The entire base erupted in cheers, thankful that they’d never have to worry about being assigned that plane again. Franks eyes wandered for a bit. I could tell he was remembering something. “How would you actually manage to bail out of a B-24 anyway?” I wondered out loud. “Through the bomb doors,” Frank replied without hesitation. There's a long pause and I can tell Frank is thinking about something. I decide to break the silence. "Frank, thanks for talking to me about this stuff," I say. "I really appreciate it." He looks up at me, and I can see the look of reflection and contemplation in his eyes. It's probably the same look that we will all have when we sit and ponder the last 70 years of our own lives, and in this case the formative years of Franks life when he put himself in mortal danger day in and day out. As always, Frank smiles. "Well thank you." His voice cracks a bit. "Thank you for talking to me about it, I appreciate that. It helps me to remember, too."